The public interface allows you to include external services and content in your public interface. These can include book cover images, user reviews, table of contents, summaries, author notes, annotations, user suggestions, series information among other services. Some of these services are free while others require a subscription. The following are some of the external content services which you can configure in Evergreen. This section calls the OpenLibrary perl module. If you wish to link to a different book cover service other than OpenLibrary, you must refer to the location of the corresponding Perl module. You will also need to change other settings accordingly. Max number of seconds to wait for an added content request to return data. Data not returned within the timeout is considered a failure. This setting is the amount of time to wait before we try again. Maximum number of consecutive lookup errors a given process can have before added content lookups are disabled for everyone. To adjust the site of the cover image on the record details page edit the config.tt2 file and change the value of the record.summary.jacket_size. The default value is "medium" and the available options are "small", "medium" and "large." Content Café is a subscription-based service that can add jacket images, reviews, summaries, tables of contents and book details to your records. To adjust settings for Content Café, edit a couple of fields with the <ContentCafe> Section of /openils/conf/opensrf.xml. Edit the userid and password elements to match the user id and password for your Content Café account. 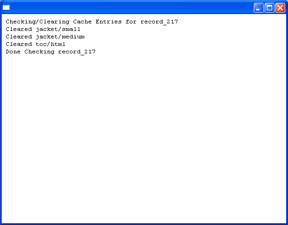 Change the return_behavior_on_no_jacket_image to set the behavior of your service when an image is not available for an item. By default this value is set to T which will result in a small image with the text "No Image Available" in place of a book cover. If you set this value to 1 a 1X1 blank image will be in place of a book cover. Google Analytics is a free service to collect statistics for your Evergreen site. Statistic tracking is disabled by default through the Evergreen client software when library staff use your site within the client, but active when anyone uses the site without the client. This was a preventive measure to reduce the potential risks for leaking patron information. In order to use Google Analytics you will first need to set up the service from the Google Analytics website at http://www.google.com/analytics/. To activate Google Analytics you will need to edit config.tt2 in your template. To enable the service set the value of google_analytics.enabled to true and change the value of google_analytics.code to be the code in your Google Analytics account. You should use the URL provided by NoveList. RefWorks is a subscription-based online bibliographic management tool. If you have a RefWorks subscription, you can activate RefWorks in Evergreen by editing the config.tt2 file located in your template directory. You will need to set the ctx.refworks.enabled value to true. You may also set the RefWorks URL by changing the ctx.refworks.url setting on the same file. An OpenURL resolver allows you to find electronic resources and pull them into your catalog based on the ISBN or ISSN of the item. In order to use the SFX OpenURL resolver, you will need to subscribe to the Ex Libris SFX service. To activate the service in Evergreen edit the config.tt2 file in your template. Enable the resolver by changing the value of openurl.enabled to true and change the openurl.baseurl setting to point to the URL of your OpenURL resolver. You will also need to edit the <userid> element to be the user id provided to you by Syndetic. For changes to be activated for your public interface you will need to restart Evergreen and Apache. 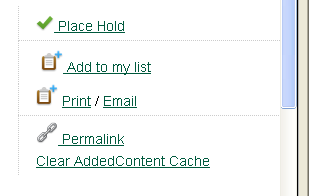 On the catalog’s record summary page, there is a link for staff that will forcibly clear the cache of the Added Content for that record. This is helpful for when the Added Content retrieved the wrong cover jacket art, summary, etc. and caches the wrong result. You can configure a "no image" image other than the standard 1-pixel blank image. The example eg_vhost.conf file provides examples in the comments. Note: Evergreen does not provide default images for these.